This Life Insurance Selling Technique helped me make a lot of money. 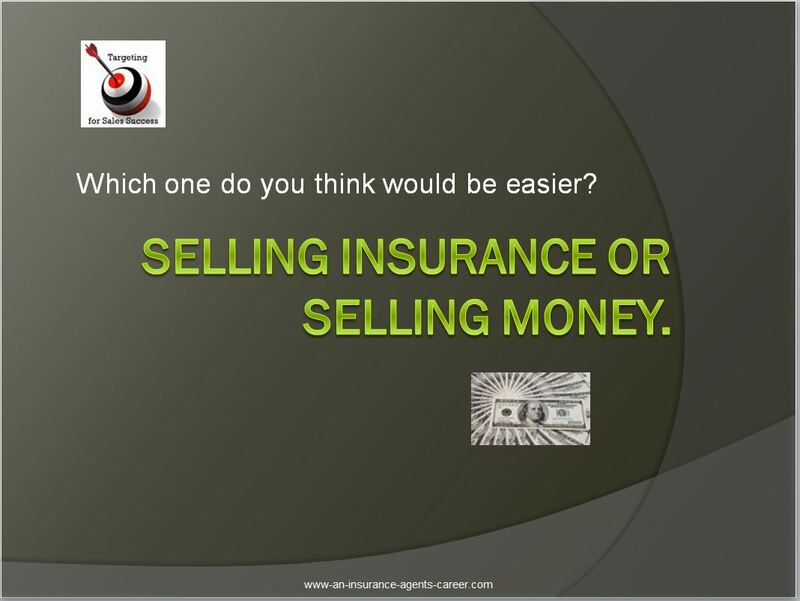 Question: Are you selling money or selling life insurance? What is it that we are really selling when we are selling life insurance? Is it peace of mind? Is it loss of income? The answer is YES to all the above. But who do you know that does not want to talk about money! Over the years I learned that selling is the process of educating people, and to educate them we must keep their attention. I also learned that selling ideas and concepts are much easier to sell than insurance policies. So somewhere along the way I decided to start selling people money. It seems like that was always a good way to get their attention. my articles on this website, you will always see my main theme popping up, which is to be successful you must learn how to sell concepts and ideas not insurance. Selling concepts along with using word pictures is the ultimate selling skill. Over time, "when people asked me what do i do", my comeback to them was that i sell money. They always seemed perplexed by that statement. And then they would say something like " how does that work, that sounds like something i could use, etc." In most cases it created an opening to try and set an interview. But lets take a moment here and reflect on what I just said. as an insurance sales person, i sell money, the same as you. isn't that what we do. It just that you probably did not realize it till this moment. Selling money to people is a concept selling skill. Lets clarify what discounted dollars are? A discounted item is something that is sold way below its actual value. in the case of a $100,000 life insurance policy that has a premium of $600 per year, we are selling this person $100,000 for future delivery at .06% per year. for a premium of $1,000 per year, we are selling this same person $100.00 for just 1% per year. I was selling my prospect on an idea or a concept. i learned this life insurance selling technique and concept selling idea from an associate of mine who used to sell estate planning policies. by using word pictures and concept selling, it became a key selling strategy for me, as well as created a new mind set for me as to what i was actually selling. it also was a simple easy way to communicate an idea or a concept to prospects. "Mr. prospect, let me ask you something. As I mentioned to you up front, I am in the business of selling money. So let me share and idea with you and your lovely wife/spouse. to pay off your mortgage so your family could stay in your lovely home. made the financial adjustment of the loss of your paycheck. Wouldn't that be a great thing. A box of money today that could do that. Furthermore, if there was a way that i asked you to only pay 1% interest on that box of money every year, would that be a good thing. 1% interest. Additionally, if you were to die before you retired, we would make sure your family would never have to pay the interest back. Would that also be a great thing. Not only that, if you did live to retirement, we would pay you back all your interest payments plus a gain. Would that even be better. Most people usually say, that sounds to good to be true." Note: depending on where you are with your prospect or client will determine where you go from here. If your at the kitchen table with a prospect or client, then you will want to move into the product presentation and the close as follows. Mr. prospect, that is the magic about buying, what I call discounted dollars. dollars for future delivery. We have three ways to do this. One is the one I just told you about, with maximum refund. the second one provides a lesser refund amount at retirement. the third one provides the box of money but no retirement option, but gives you the option to enroll in any of the above two at a future date. Let me show you the tool we will use to accomplish this and how this works. Just like anything else, it takes time and patience along with a few mistakes to fine tune this Life Insurance Selling Technique to fit your situation. It is a great concept to use to open up any type of business insurance or business continuation plans, buy or sells, etc with a business owner. A quick 45 second story to get their attention. Remember, experience is the cumulative result of trial and error.